Podcast 292 – Makana the Mighty! Posted in Art, Consciousness, Creativity, Evolution, Future, Makana, Occupy. Great V for Vendetta painting! Musicians do care. There are plenty of socially progressive, thought provoking artists, the only problem is you won’t hear them on the radio or selling products. I am one and I’ve been making records for years. I can say though that my music didn’t get to the heart of this, until after 911. PEACELIGHTLOVE!!!!!! i’m so glad you posted this, Lorenzo, despite the less than perfect audio quality. in my opinion this is the podcast of the year! it very nearly brought tears to my eyes.. Makana expresses the thoughts behind this revolution in such a beautiful and direct way. 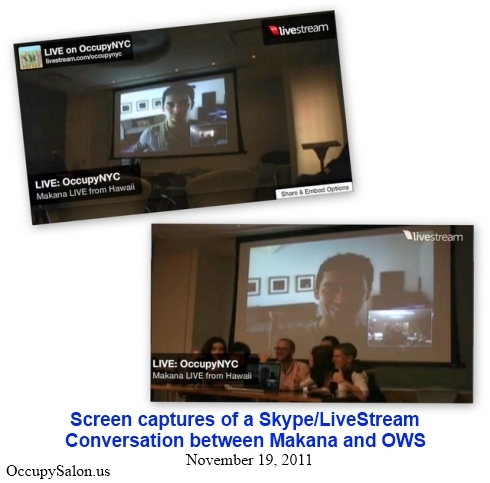 thank you so much for documenting this and so many other important moments in the #OWS movement. Total paraphrase since I can’t remember which podcast he said that in, but the context was one of his explanations about culture and progress being dependent on the evolution of language. I guess our survival also depends on the evolution of music.